Eclectic style is defined by interiors with not only varied styles, but also a variety of eras, color palettes, and textures. It is a style where the goal is to look "collected" over time. An eclectic space can have more "splurges" for higher end pieces because the cost of the space is spread out over time...sometimes years. Today I'm going to recreate budget friendly versions of some of my favorite eclectic spaces to show you that these rooms can be accomplished affordably. I believe that most people who have eclectic style have a "leaning" towards another style or era. I have eclectic style. I want variety in my space, but I tend to gravitate to more modern lines within the mid-century era. I always start a space with a modern foundation and then get eclectic from there. Your "stylistic leanings" can help you know where to start. One of my absolute favorite eclectic designers is Jenny Komenda from the Little Green Notebook. The living room in her former home is so fun and stylish, and has some very unique pieces. According to her blog some are purchases, some are updated thrift finds, and some are DIYs. There are exceptions, but an eclectic space is usually built upon a neutral foundation. Eclectic style also has at least one element in the room that ties the variety together. This is key for an eclectic space to feel grounded. In her living room Jenny uses a greenish-gray neutral foundation and then creatively weaves details of black all through her design. I agree that $3,200 is not pocket change, but all of these items are super affordable on their own and it's a great price for the amount of furniture within the budget. Rug Runner: Ebay; This size rug bought from a store would be $500 or more. This will get bid up to about $100 but sometimes you can get them for much less. The Bemz slipcovered IKEA chair is a little bit of a splurge, but I included it to share with you one of my favorite "custom on the cheap" tips: buy an IKEA chair in their "as is" section. These items are sometimes more than 75% off the price because they do not come with slip covers. Order the slipcover from Bemz and you have a really custom piece for an affordable price. If this room is still out of budget then try updating a thrift store find, searching estate sales, or waiting patiently for store sales. Doing these things could drop this eclectic living room to an even lower budget. I have always loved this beautiful eclectic dining room. 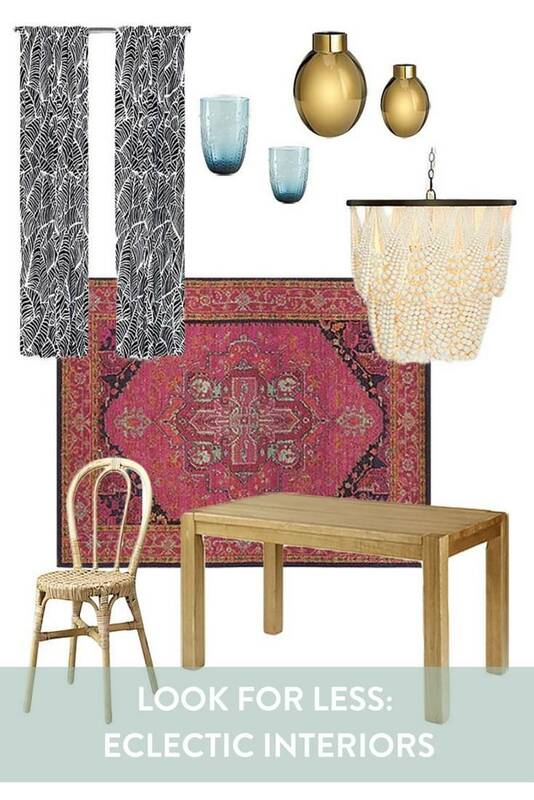 I love the mix of the rustic modern table, the MCM dining chairs, and the more traditional rug and fixture. The Pottery Barn light fixture was definitely a splurge, but a larger version of this DIY bead chandelier from A Beautiful Mess could drop this room down under $1000! Eclectic design has a fun personality that is unique and personal. I hope this helped you not only understand what defines an eclectic interior, but also see how you it can fit into an affordable budget.